For now over ten years, Provence Santé has endeavoured to satisfy the consumer's demand for naturalness and authenticity with products of quality that strictly respect man and his environment. This spa brand has risen to national fame in a field where by rule quality must satisfy the most rigorous demands. Provence Santé has been one of the first French cosmetics brands to use the prodigious properties of olive oil in the treatment of dry to very dry skin. It was back in 1995 that PROVENCE SANTE created the JARDN DE L'OLIVIER cosmetics line built upon the virtues of olive oil, that earned them a preponderant position thanks to the vast array of bath as well as body and facial care products made from natural and organic products they offered. 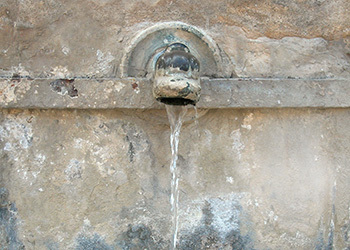 Provence Santé is also involved in ethical, artistic and civic activities. For the last few years, WATER has been their hobby-horse, and they devote part of their energies to the defence of this treasure which is humanity's source of life with which women have a particularly close relationship where beauty, hygiene or social interaction are concerned. Water and Women are quite simply symbols of life. So, discover this young enterprise which has managed to find the perfect balance between natural cosmetics and traditional cosmetics, swimming indefatigably against the current, far from commercial stereotypes. Because their steadfast aim is HARMONY. It was back in 1995 in Rochefort-du-Gard that the venture began. At the start, two personalities: Stéphane LECAILLE and Natacha LECAILLE have sowed the seeds of a new era in the field of cosmetics. After participating in the development of l'Occitane, Stéphane LECAILLE joined the team of an important subcontracting laboratory: Laboratoires Ardéchois de Cosmétique (ARDECOSM), as technical and commercial Manager. In 1990 Natacha LECAILLE joined Ardécosm's Research and Development department. Five years later, with the benefit of their common experience, they founded PROVENCE SANTE. The story of Provence Santé begins about fifteen years ago with a display set on trestles on the shaded side of lively little squares in typical Provence villages. Everything the "Nature of Provence" has to offer in the way of blessings for Man was collected in these displays: her exceptional scents - multiple and unique - as well a her flavours so specific, rich and refined - which alone and of themselves typify a whole "art of living". The creation of this brand was achieved with the intent of developing specific lines of products powerfully inspired by their geographic origin: The Provence. From its inception, the brand is characterized by words such as naturalness, harmony and authenticity. A philosophy: The vocation is care, the inspiration is Provence. The products' formulas therefore come as close to nature as ever possible. They are sincere and refined. Utmost care is exercised in researching active principles, and suppliers are required to guarantee the traceability of raw ingredients. Their firm determination was to do away with conventional formulas based on traditional chemistry, while at the same time and above all, preserving the innocuousness of products and seeking efficacy and comfort in their use. The company distances itself from the conventional and navigates against the current. Visionary? Most certainly yes, since a few years later, the "organic" and "natural" wave was sweeping the French market. For their dream to materialize, they bought out a small enterprise located in L'Isle-sur-la-Sorgue that was active on several local Provence open air markets, thus enabling them to put their project and ideas to work. The workforce totals ten persons: one in research and development, one secretary/accountant, one buyer, one export sales person, one head of workshop, two conditioning specialists, two shipping clerks and one manager. The sales force is manned by three sales representatives (covering the PACA region, Rhône-Alpes and Paris), for a total of five men and eight women. The harmony of a contrasting nature: Located between Uzès and Barjac, in the Haut-Gard region, isolated on its rocky plateau and only accessible via one only road, Lussan is the epitome of the "perched village". Lengthy periods of unrest due to numerous conflicts necessitated the deterrent of a fortress and also of a fortified wall, still INTACT today. It is in this atypical, magical, off-the-beaten-rack landscape, in the heart of the "garrigue" that Provence Santé manufactures, with utmost regard for authenticity, its lines of body care products. Obviously, the R & D department is of primary importance since all the products are formulated and tested on the spot. 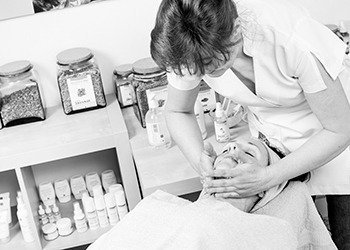 The body care protocols are elaborated by Natacha Lecaille. Finalizing of the development is done on the spot, then a panel of spas/ partners is called upon to finalize and approve the development. The entire manufacturing phase is subcontracted by a French laboratory which ranks among the most important in the country, specialized in natural and organic cosmetics. This particular plant was a logical choice on the part of Provence Santé who insisted on preserving the brand's philosophy of protection of the environment, as the factory adheres to the principle of protection of the environment and is titular of an Ecocert certification. As regards the raw ingredients, their origins are diverse, with the exception of the active principles, which are supplied locally wherever possible, thus adhering to the concept of a genuine Provence enterprise. Although the brand enjoys a solid presence in France with over 400 distributor spas - an increase of 20% per year for the last three years - Provence Santé historically draws over 50% of its sales from export. The brand, in fact, is sold in the USA, Australia, Japan and of course in Europe (Belgium and Italy). Whether a working woman or an executive, a country or a city dweller, aged 20 or 75, all women seek the same thing: a feeling of well being, the renewed pleasure of feeling beautiful in her own eye and in the eyes of others. Provence Santé's goal is to bring one same answer to all women regardless of age or social or professional class. This is the reason why we position our prices with particular attention. In fact, the Provence Santé woman finds perfect harmony thanks to the formulation of products which are pleasant to the touch, with natural raw ingredients, efficacious results due to the concentration of active principles, and fragrances that are the stuff of dreams. In short, comfort, pleasure, results at a fair value for the money. 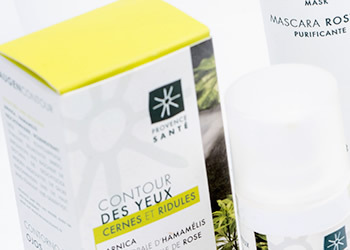 Besides the quality of the products and treatments, Provence Santé builds customer loyalty with several types of incentives such as vouchers, loyalty card, samples, etc. The selection of a brand specifically built upon natural or organic products at a time when that market was just marginal, is essentially the result of Stéphane's and Natacha's product culture and their particular interest in natural cosmetics. They wanted to offer lines of specifically Provencal cosmetics as an alternative to traditional cosmetics. The very name of the brand was their actual inspiration: "Provence" - a region whose name is synonymous with pleasure and well being, which inspired numerous painters and writers among whom VAN GOGH and JEAN GIONO. "Santé" - a promise kept and verified of the guarantee of actual results obtained from products whose formulas are rich in active principles. It is important to note that Provence Santé has chosen one of the most difficult and demanding distribution networks: the beauty spas. This was not a chance decision on the part of the enterprise, because their aim was to create a genuine relation between the brand and the consumer. The beautician who attends the client in a private booth represents the link between the world of the professionals and the consumer. She becomes the guiding presence who can promote the benefits and the properties of the brand's products. Demanding as it may be, this network represents a perfect slot for a different kind of cosmetics, which is more and more attractive among beauticians: the natural kind of cosmetics. At first the object of suspicion, Provence Santé succeeded in building an ever growing number of loyal clients with their wide array of products of genuine quality at a fair price in to-day's market. Provence Santé is very attentive to man and his environment, yet without being "ecological extremists". Rather, the enterprise is striving to find the right balance between naturalness and technology through the concept of "controlled natural cosmetics", with HARMONY as their keynote. Moreover, the selection of airless bottles or tubes which prevent the product from exposure to air allow the use of unconventional preservative agents. Stability, compatibility, ageing tests, challenge tests (to verify the efficacy of the preservation agent), innocuousness and efficacy tests are carried out for the sole purpose of guaranteeing an optimal level of quality in our products. Manufacturing: the manufacturer had necessarily to adhere to the philosophy which has been Provence Santé's from the inception of the brand. This is why a manufacturer was selected which ranks among the leaders in the natural and organic cosmetics market in France. Packaging: Of course, environment friendly packaging has been sought, instead of excessive amounts of wrapping or protection materials, and Provence Santé is attuned to the problems arising from the use of certain types of plastics. The Spas: No paper is used in advertising - no catalogue. Our website is the primary channel of communication that provides abundant information on the products and the beauty care protocols.